A Sikh religious leader in Illinois said he asked a local law enforcement agency to drop its investigation of a hate crime allegedly committed against him because the agency was not committed in its pursuit of the case. The Military Religious Freedom Foundation has demanded that a U.S. naval hospital in Japan remove a Bible and other religious materials from a display honoring missing soldiers. A Pew Research poll concluded that women in the U.S. are more religious than men, and the gap between men and women in the U.S. is greater than that in comparable countries. The City of New York has agreed to consult Muslim groups as it drafts new guidelines for any future surveillance activities; the agreement is part of the settlement reached between the NYPD and New Jersey-based Muslim organizations that had sued after the NYPD’s post-9/11 surveillance of Muslim groups was made public. How does religion shape the modern battlefield? Ron E. Hassner proposes that religion acts as a force multiplier, both enabling and constraining military operations. This is true not only for religiously radicalized fighters but also for professional soldiers. In the last century, religion has influenced modern militaries in the timing of attacks, the selection of targets for assault, the zeal with which units execute their mission, and the ability of individual soldiers to face the challenge of war. Religious ideas have not provided the reasons why conventional militaries fight, but religious practices have influenced their ability to do so effectively. In Religion on the Battlefield, Hassner focuses on the everyday practice of religion in a military context: the prayers, rituals, fasts, and feasts of the religious practitioners who make up the bulk of the adversaries in, bystanders to, and observers of armed conflicts. To show that religious practices have influenced battlefield decision making, Hassner draws most of his examples from major wars involving Western militaries. They include British soldiers in the trenches of World War I, U.S. pilots in World War II, and U.S. Marines in Iraq and Afghanistan. Hassner shows that even modern, rational, and bureaucratized military organizations have taken—and must take—religious practice into account in the conduct of war. This volume explores how religious leaders can contribute to cultures of peace around the world. The essays are written by leading and emerging scholars and practitioners who have lived, taught, or worked in the areas of conflict about which they write. Connecting the theory and practice of religious peacebuilding to illuminate key challenges facing interreligious dialogue and interreligious peace work, the volume is explicitly interreligious, intercultural, and global in perspective. The chapters approach religion and peace from the vantage point of security studies, sociology, ethics, ecology, theology, and philosophy. A foreword by David Smock, the Vice President of Governance, Law and Society and Director of the Religion and Peacebuilding Center at the United States Institute of Peace, outlines the current state of the field. Antagonistic Tolerance examines patterns of coexistence and conflict amongst members of different religious communities, using multidisciplinary research to analyze groups who have peacefully intermingled for generations, and who may have developed aspects of syncretism in their religious practices, and yet have turned violently on each other. Such communities define themselves as separate peoples, with different and often competing interests, yet their interaction is usually peaceable provided the dominance of one group is clear. The key indicator of dominance is control over central religious sites, which may be tacitly shared for long periods, but later contested and even converted as dominance changes. By focusing on these shared and contested sites, this volume allows for a wider understanding of relations between these communities. Using a range of ethnographic, historical and archaeological data from the Balkans, India, Mexico, Peru, Portugal and Turkey, Antagonistic Tolerance develops a comparative model of the competitive sharing and transformation of religious sites. These studies are not considered as isolated cases, but are instead woven into a unified analytical framework which explains how long-term peaceful interactions between religious communities can turn conflictual and even result in ethnic cleansing. Maluku in eastern Indonesia is the home to Muslims, Protestants, and Catholics who had for the most part been living peaceably since the sixteenth century. In 1999, brutal conflicts broke out between local Christians and Muslims, and escalated into large-scale communal violence once the Laskar Jihad, a Java-based armed jihadist Islamic paramilitary group, sent several thousand fighters to Maluku. As a result of this escalated violence, the previously stable Maluku became the site of devastating interreligious wars. This book focuses on the interreligious violence and conciliation in this region. It examines factors underlying the interreligious violence as well as those shaping post-conflict peace and citizenship in Maluku. The author shows that religion—both Islam and Christianity—was indeed central and played an ambiguous role in the conflict settings of Maluku, whether in preserving and aggravating the Christian-Muslim conflict or supporting or improving peace and reconciliation. Based on extensive ethnographic fieldwork and interviews as well as historical and comparative research on religious identities, this book is of interest to Indonesia specialists, as well as academics with an interest in anthropology, religious conflict, peace and conflict studies. How was violence justified in early Islam? What role did violent actions play in the formation and maintenance of the Muslim political order? How did Muslim thinkers view the origins and acceptability of violence? These questions are addressed by an international range of eminent authors through both general accounts of types of violence and detailed case studies of violent acts drawn from the early Islamic sources. Violence is understood widely, to include jihad, state repressions and rebellions, and also more personally directed violence against victims (women, animals, children, slaves) and criminals. By understanding the early development of Muslim thinking around violence, our understanding of subsequent trends in Islamic thought, during the medieval period and up to the modern day, become clearer. In the post-9/11 world, where boundaries between faith and global politics are fluid, religion is often criticized for stoking extremism and underwriting violence. But can the enmeshed relationship between faith and politics also be the starting point for a new era in peacebuilding and conflict resolution? How can religious leaders and foreign policy makers work together to lay the foundations for peace in hotspots around the globe? Join us for a forum on the intersection where secular politics and the world’s faith traditions meet. In exploring the connections between religion, violence and cities, the book probes the extent to which religion moderates or exacerbates violence in an increasingly urbanised world. Originating in a five year research project, Conflict in Cities and the Contested State, concerned with Belfast, Jerusalem and other ethno-nationally divided cities, this volume widens the geographical focus to include diverse cities from the Balkans, the Middle East, Nigeria and Japan. In addressing the understudied triangular relationships between religion, violence and cities, contributors stress the multiple forms taken by religion and violence while challenging the compartmentalisation of two highly topical debates – links between religion and violence on the one hand, and the proliferation of violent urban conflicts on the other hand. Their research demonstrates why cities have become so important in conflicts driven by state-building, fundamentalism, religious nationalism, and ethno-religious division and illuminates the conditions under which urban environments can fuel violent conflicts while simultaneously providing opportunities for managing or transforming them. 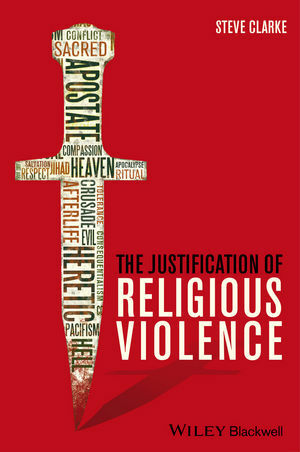 Next month, Wiley-Blackwell will publish The Justification of Religious Violence by Steve Clarke (Charles Sturt University & University of Oxford). The publisher’s description follows.